CreditID123's credit monitoring service provides you with extensive benefits, such as access to your credit score and credit reports, credit card fraud detection, real-time social security number monitoring, instant alerts for suspicious activity, and a $1 million identity theft policy. Your credit score is an incredibly important factor that determines many of your financial ventures, including loan approvals, insurance applications, and even applying for a job. If your personal information is compromised and ends up online, cyber thieves can open accounts, max out credit cards, and take out loans for cars or homes in your name. CreditID123's modern credit monitoring services can help prevent this situation through several means. CreditID123 not only gives you access to your credit score and credit reports but also provide real-time social security number monitoring, credit card fraud detection, instant alerts for suspicious activity, and up to a $1 million identity theft policy. Signing up for CreditID123 is simple. You only need to create an account and provide basic information to receive access to your Equifax, Experian, and TransUnion credit reports. Additionally, you will receive other services such as a credit score calculator, identity fraud alerts, and the ability to monitor your name and social security number on billions of public records. Comprehensive Credit & Fraud Alerts: CreditID123 monitors over 700 billion data elements each day to check for suspicious activity associated with your accounts and sends alerts for any suspicious activity or compromised information. Access to Credit Scores: Users have access to Equifax, Experian and TransUnion credit scores and three-bureau credit monitoring. Identity Restoration: If your identity is stolen, CreditID123 handles the paperwork, phone calls, and notifications needed to get your identity restored. Identity Theft Protection: Depending on the specific plan you purchase, CreditID123 offers up to $1,000,000 in identity theft insurance. Their industry-leading protection covers you for lost wages, legal defense and expenses, and other costs associated with restoring your identity. You only receive credit reports and score updates every 30 days. The scores you receive from CreditID123 vary from your FICO® score, which is what lenders generally use. CreditID123 charges $2.00 for a 1-time credit score lookup. 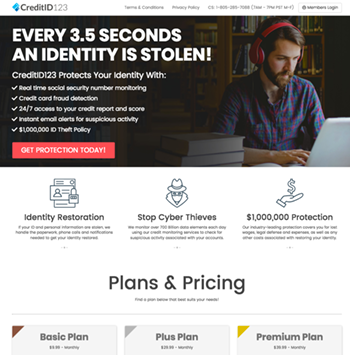 For additional monitoring and protection, plans begin at $9.99 per month and range up to $39.99 monthly for CreditID123's full suite of identity theft and credit monitoring protection. What is the pricing of CreditID123? CreditID123's pricing begins at $9.99 per month. Additional features can be added on to the basic services. CreditID123 offers a 30-day trial period for $9.99. This includes a 1-time credit score lookup with one month of full access to credit score tools and calculator, your credit report and fraud alerts. Once the trial period is over, you will be billed for their monthly services if you do not cancel. How frequently do they update my credit score? Your credit score is updated monthly with a CreditID123 membership. CreditID123 provides monthly monitoring of your credit score, fraud alerts, identity theft insurance, and the ability to monitor your name and social security number on billions of public records.